hd00:15Slow motion of carefree girls and guys multiethnic group taking selfie with smartphone sitting on plaid in park with food and drinks having fun together. 4k00:08Zoom-in of attractive girl playing the guitar on picnic while her friends are listening to music and singing then clapping hands. Outdoor activities and friendship concept. 4k00:12Bearded man is celebrating birthday with friends in park blowing candles on cake shouting and expressing positive emotions while friends are laughing and clapping hands. 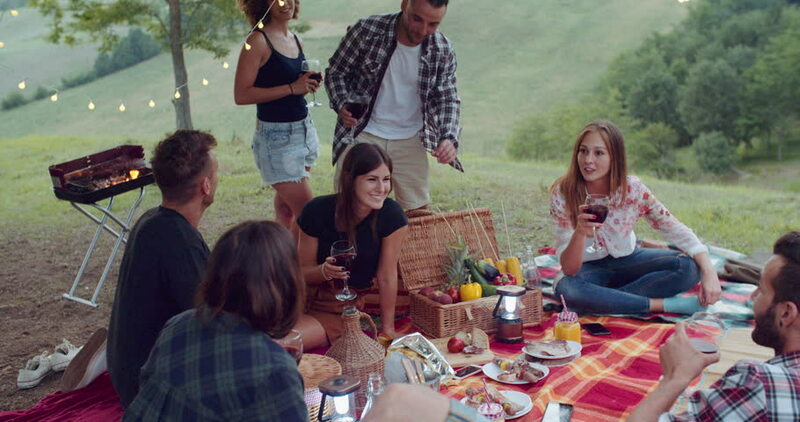 hd00:14Slow motion of cheerful young people multi-ethnic group clinking glasses with drinks then drinking sitting on comfy blanket on grass during autumn picnic. 4k00:104K Happy group of friends having fun at outdoor bbq. Shot on RED Epic. hd00:15Slow motion of happy students playing the guitar and enjoying music in park on picnic in autumn, guitarist is playing while his friends are clapping hands.